Hemisphere GNSS' new Crescent™ P206™ and P207™ OEM modules use GPS, GLONASS, and BeiDou, and are Galileo and QZSS ready. Track more signals for unparalleled positioning performance even in challenging environments. Leverage the compact size and easy integration in your design. The 34-pin P206 module is a drop-in upgrade for many Hemisphere products. P207 is a drop in upgrade for existing Crescent designs using standard 20 pin modules from other manufacturers. Don’t compromise; position with RTK accuracy using multiple satellite systems today! 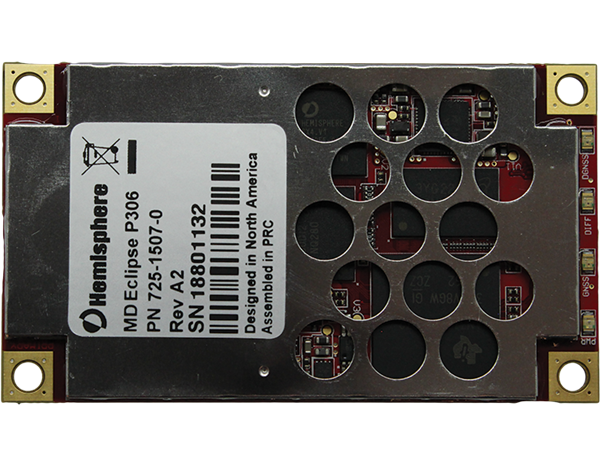 Hemisphere GNSS’ new Eclipse™ P306™ and P307™ OEM boards use GPS, GLONASS, and BeiDou, and are Galileo and QZSS ready. Track more signals for unparalleled positioning performance even in challenging environments. Leverage the compact size and easy integration in your design. 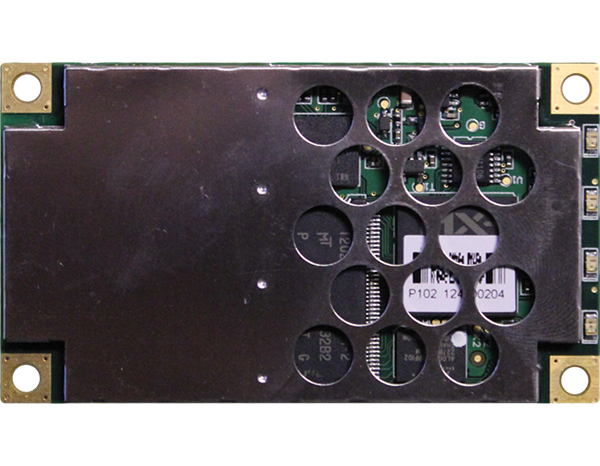 The 34-pin P306 board is a drop-in upgrade for many Hemisphere products. P307 is a drop- in upgrade for existing designs using standard 20 pin boards from other manufacturers. Patented COAST™ software enables Hemisphere receivers to utilize previous DGPS and SBAS correction data during times of interference, signal blockage and weak signal. The receiver will coast and continue to maintain sub-meter positioning for up to 40 minutes without any DGPS signal. When your corrections are only for one GNSS constellation, for example GPS using SBAS, Hemisphere’s patented SureTrack™ goes to work to model all other satellites, helping maintain an accurate solution in challenging environments. With the Eclipse P306 and P307, RTK performance is scalable. Utilize the same centimeter-level accuracy in either single frequency mode, or employ the full performance and fast RTK over long distances with multi-frequency multi- constellation GNSS signals. 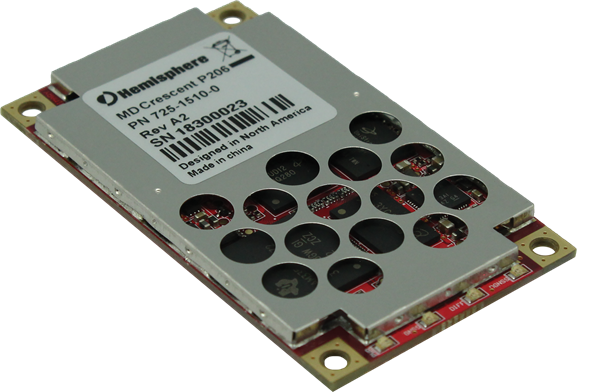 The Crescent® Vector™ H200™ GNSS board is the next generation, single frequency, high-performance GNSS heading, positioning, and attitude board available on the market from Hemisphere GNSS. The Vector H200 GNSS board provides integrators with an opportunity for developing sophisticated marine, navigation, and land applications in challenging, dynamic environments. 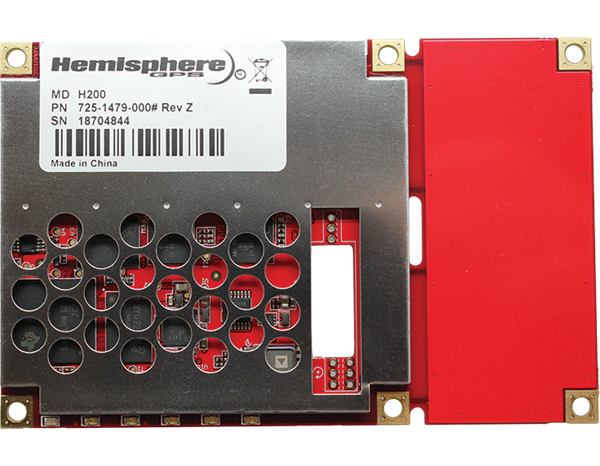 The H200 board uses Hemisphere GNSS’ advancements in Vector technology; advanced multipath mitigation techniques and Hemisphere GNSS’ patented Multifunction Application. Vector H200 is capable of providing heading of 0.02° with a 5 meter antenna baseline and either RTK, L-Band, or SBAS positioning depending on your location requirements. Integrate the robust Vector H200 board into your applications to experience exceptional heading, positioning, and attitude performance within a compact size. Diversity and cost savings makes it an ideal part of your solution for system integrators. Develop sophisticated machine control and navigation solutions in a world full of complex dynamic environments. The Vector™ H320™ is our most advanced GNSS heading and positioning board available from Hemisphere GNSS. The Vector H320 utilizes dual antenna ports to create a series of additional capabilities to Eclipse™ Vector technology including fast, high-accuracy heading over short baselines, RTK positioning, onboard L-Band DGNSS reception, RTK-enabled heave, low power consumption, and precise timing. Integrate the Vector H320 into your applications to experience exceptional performance, flexibility and cost savings. 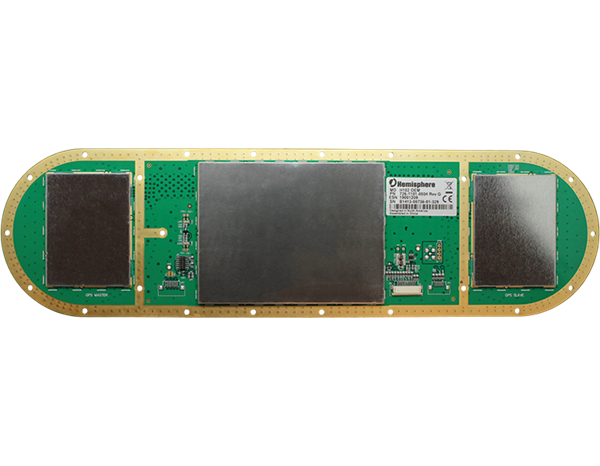 This incredible GNSS board uses advanced multipath mitigation techniques and offers full scalability and expandability from L1/L2 GPS/GLONASS to L1/L2 GPS/GLONASS RTK performance. Enjoy the simplified integration, flexible communication, and powerful, precise performance of the all-in-one Vector™ H102™ GPS compass OEM board. The integrated Crescent® Vector™ II technology offers precise heading and positioning as well as heave, pitch, and roll output. 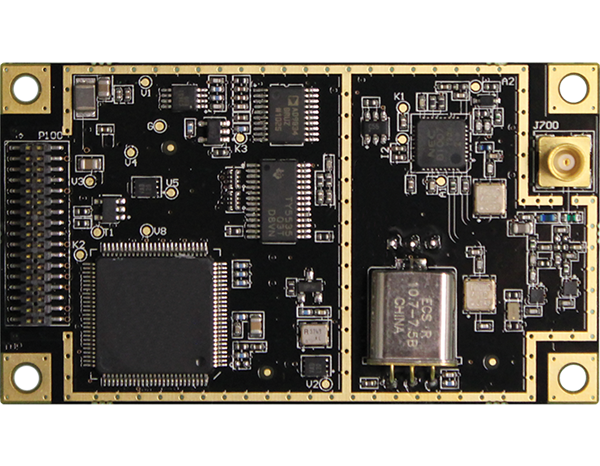 The Vector H102 integrates two GPS antennas, a CANBUS communications processor, a single axis gyro, tilt sensors and a power supply into a single board. The dual antennas allow for ease of integration into your application and provide 0.75 degree heading and 1.0 m position accuracy even while sitting stationary. The gyro and tilt sensor improve system performance and provide backup heading information if the GPS-based heading is temporarily lost. The integrated Crescent Vector II technology provides more accurate code phase measurements and improved multipath mitigation resulting in excellent accuracy and stability. 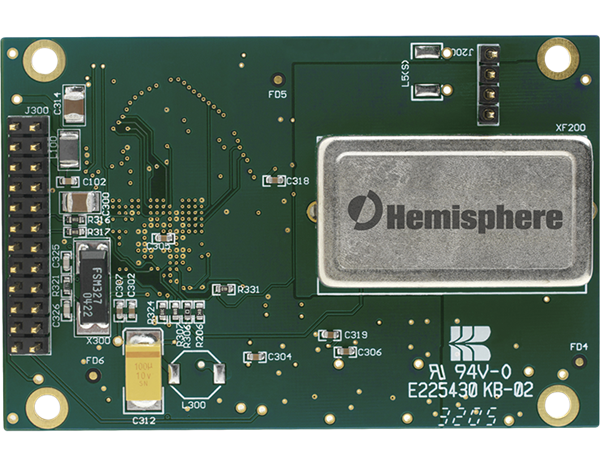 Improve GNSS positioning accuracy by adding L-Band differential capability with Hemisphere GNSS’ LX-3TM OEM board. L-Band differential signal corrections are broadcast via satellites to cover most land areas worldwide. The LX-3, coupled with Hemisphere GNSS’ exclusive P206, P306, and H200 boards, can track L-Band high precision signals that improve position accuracy to better than 10 cm. It is an ideal alternative or backup to other differential sources such as RTK, SBAS (WAAS, EGNOS, MSAS, etc.) and radiobeacon, especially in regions where those signals are difficult or impossible to track. The LX-3 automatically tracks the best differential satellite broadcast if more than one is available in a particular region or tracks a specific satellite manually set by the user. The LX-3 comes as an OEM board that can easily be mounted with a P206, P306, or H200 board for optimal performance. Provide a reliable source of differential corrections with the SBX- 4™ radiobeacon board that augments a separate GPS receiver with free accuracy-improving correction data from networks of beacon stations located throughout the world. With dual-channel architecture to ensure the best station is always being decoded, the SBX-4 delivers high performance reception and a wide range of functionality including the capability to be tuned to signal strength or station distance. The SBX-4 outputs the industry standard RTCM SC-104 format accepted by differential-ready GPS receivers and can also be configured and monitored with NMEA 0183 protocol.